PRINCETON, NJ -- Seventy-two percent of U.S. Muslims approved of the job President Barack Obama was doing as president during the first six months of 2014, higher than any other U.S. religious group Gallup tracks. Mormons were least approving, at 18%. In general, majorities of those in non-Christian religions -- including those who do not affiliate with any religion -- approved of Obama, while less than a majority of those in the three major Christian religious groups did. The results are based on aggregated data from more than 88,000 Gallup Daily tracking interviews conducted in the first six months of 2014 -- a time when the president averaged 43% job approval among all Americans. 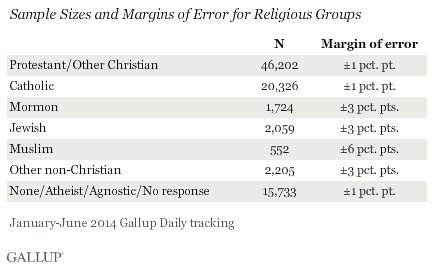 Gallup interviewed 552 Muslims and at least 1,700 respondents in every other religious group during this time. The United States remains a predominantly Christian nation, with roughly half of Americans identifying with a Protestant religion and another quarter identifying as Catholics. 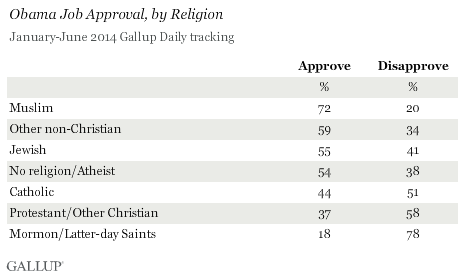 Thus, the opinions of these Christian groups are by far the most influential in determining Obama's overall ratings. 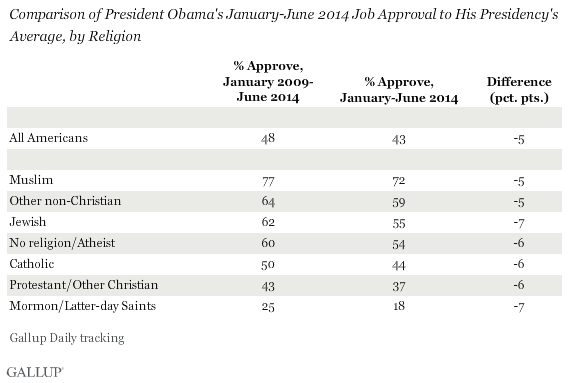 The relative rank order of the religious groups on job approval has been consistent throughout Obama's presidency. In fact, the current rank order, with Muslims most approving and Mormons least, exactly matches the order seen over the more than five years he has been in office since January 2009. Moreover, current job approval among each religious subgroup is between five and seven percentage points lower than the full 2009-2014 average for each. Obama's current 43% overall job approval average is five points lower than his 48% average so far in his presidency. In general, when Obama's approval rating has dropped among all Americans, his approval rating in each religious subgroup has dropped by a similar amount. The accompanying graph shows how Obama's average approval rating among Protestants, Catholics, and Mormons has compared with the average among all Americans over time. Because the movement in each religious group has shadowed the national movement, Mormons have been least approving of Obama in each time period. Protestants have been consistently below the national average, and Catholics slightly above it. Similarly, Muslims have been the most approving among the religious groups in each time period. Jewish Americans and Americans with no religious preference have also exceeded the national average job approval in each time period, tracking each other closely. The patterns in Obama's job approval by religion have prevailed throughout his presidency, with Muslim, Jewish, and nonreligious Americans giving him higher ratings, and Mormons and Protestants giving him the lowest ratings. Catholics have typically been closest to the national average, but slightly above it. As Obama's overall job approval rating has had its ups and downs over the five-plus years he has been president, his ratings among religious groups have moved in tandem. That is, Americans of various faiths seem to react similarly to the factors that cause the president's popularity to wax and wane, rather than reacting in idiosyncratic ways tied to their religious beliefs. Clearly, members of various religions view the president quite differently, but this may be attributable more to whether Obama's Democratic affiliation matches the political leanings of each religious group, and less to the specific policies and actions he has taken throughout his presidency. Results for this Gallup poll are based on telephone interviews conducted January-June, 2014, on the Gallup Daily tracking survey, with a random sample of 88,801 adults, aged 18 and older, living in all 50 U.S. states and the District of Columbia.